Still active today, the Munich band Embryo has been one of the most important and inventive bands of the German jazz-rock school. Their formation in 1969 revolved around a nucleus of Christian Burchard, Edgar Hoffmann and Lothar Meid (bass). It seems to be a continental phenomenon to have drum playing band leaders, just think of Mani Neumeier (Guru Guru) and Christian Vander (Magma). Embryo's founder Christian Burchard had started his musical career by playing organ in several local rhythm and blues bands. In 1964 he switched to vibraphone and jazz when he founded the Contemporary Trio with Edgar Hoffmann (I don't know the third member). Three years later they attempted to expand the boundaries of free Jazz with Chris Karrer, Peter Leopold, Dieter Serfas and Jimmy Jackson. These musicians soon rose to fame in Amon Duul II. Christian Burchard was a guest on their first album Phallus Dei (1969). In 1967 he also played with future Between members Peter-Michael Hamel (keyboards) and Roberto Detree (guitar) at the Song Parnass in Munich. Unfortunately no recordings are known of this exciting combination. Burchard and Hoffmann also joined the Mal Waldron Quartet in 1967 and stayed for two years. Mal Waldron is an internationally well-known black American piano player who has worked with jazz legends such as Billie Holiday and John Coltrane. They also performed live with Mal Waldron, and got to know proficient jazz soloists such as Steve Lacy, Stu Martin, Don Menza, Natan Davis and Lucky Thompson. Lothar Meid also had a jazz background. He brought to Embryo two of the musicians he had played with in a sixties jazz and soul quintet: Jimi Jackson and Wolfgang Paap. Also Dieter Serfas, Ingo Schmidt and John Kelly were early members of Embryo. Kelly came to Germany touring with a Scottish hard rock band and had played blues with Alvin Lee before he formed Ten Years After. Early live tracks are included as bonus tracks on the CD issue of Opal. In Autumn 1969 the first personnel changes took place in Embryo. In fact I don't know of any other German group with such a complex family tree as them! This may be due to the prototype jazz musician's fear of being locked up in the group format as in rock music. Lothar Meid left to join Doldinger's Motherhood. His replacement was Ralph Fischer, previously part of a folk trio that also included Peter-Michael Hamel. Before the recording of Opal in April 1970, the group had been reduced to a quartet of Hoffmann, Burchard (now playing drums besides vibraphone), Fischer and Kelly. Bettsy Allech (vocals), Roberto Detree (motocello, later a member of Between) and Holger Trultzch (bongos, later a member of Popol Vuh) contributed to the album as guests. Opal was a highly inventive fusion of rock, jazz, blues, soul and psychedelia, the first of five forthcoming classic albums. Guitar riffing as used on the track "You Don't Know What's Happening" was never to be heard from Embryo again after Kelly quit in June 1970. However, the soloist who really was given time to excel was Edgar Hoffmann, helping to define a unique German fusion sound also explored by Xhol and Out Of Focus. Hoffmann's electric violin and sax graced tracks like "Revolution", "Call" (a Mal Waldron composition) and "People From Outer Space". The original copies of Opal had a cover cut-in with a balloon attached, the legendary gimmick of the first Ohr albums. Copies with the balloon still intact are now of course extremely rare and usually sold for more then 250 DEM. The disbanding Xhol supplied Embryo with Hansi Fischer upon their demise at the end of 1970. Also Roman Bunka joined Embryo (replacing Ralph Fischer). At this time he was only 19 years old. He was to quit and rejoin Embryo several times, but nevertheless was one of their most important members. Embryo's Rache (1971) without a guitarist. On this album they were also aided by friends: Jimi Jackson, Hermann Breuers (electric piano, organ) and Franz Bontgen (vocals). The album was recorded at the Dierks studio. Embryo's long lasting passion for refined rhythms began to shine through on this album, noticeably on the opening track "Tausendtussler" . If Hoffmann was the instrumental backbone of Opal, it was Fisher's flute and Jackson's keyboards (particularly on Jackson's own contribution "Revenge") that dominated this time. This was really an album of fantastic instrumental duels more jazzy in direction than Opal, with only occasional vocals. Bunka and Fischer soon went their own ways. Burchard and Hoffmann re-recorded the Waldron composition "Call" in a great 18 minute version close to conventional jazz with Jackson, Waldron and Jorg Evers (bass) late in 1971. This wasn't exactly what their record company United Artists wanted, and they turned down both this recording and the subsequent Rocksession recordings from February to March 1972. The latter was at last released on Brain at the end of 1973. Burchard and Hoffmann was joined by Dave King on some of the recordings when Evers quit for Amon Duul II and later Achtzehn Karat Gold. A guitarist (he also played more exotic string instruments) firmly rooted in jazz, Siegfried Schwab, also joined Embryo. He came from Wolfgang Dauner's Et Cetera, and brought important ethnic influences Into the band. The Rocksession album started with a short "rock" song ("A Place To Go"), but the other three tracks were extended jazz instrumentals of a high quality. Also a fourth jazz instrumental, "Dreaming Girls", was recorded during these sessions. This appeared on Embryo's other Brain album Steig Aus (1973), along with the already recorded "Call". Again reduced to a quartet Embryo at last managed to please United Artists with Father, Son & Holy Ghost (1972), recorded in March 1972 at Studio 70, Munich. The absence of keyboards made this album sound remarkably different from Rocksession. Schwab's stringed instruments were the highlight this time. Also the album had a more accessible style, at times almost relaxing. As usual the group disintegrated some months after the recordings. When Embryo appeared live in Munich during the Olympic games in September 1972, Burchard had assembled Roman Bunka (apparently talked into rejoining) and Dieter Miekautsch (fresh from Missing Link, now being a member of Embryo and Missus Beastley simultaneously). Burchard, Bunka and Jimi Jackson recorded the last track for Steig Aus: "Radio Marrakesh/Orient Express", a brilliant 10 minute two-part piece starting with some exotic, ethnic bouzouki and vibraphone interplay, and ending in an energetic jazz-rock fusion, driven by organ, electric piano and guitar. Burchard's steady rhythm was the engine of the Orient Express while Jackson's mellotron blew the whistle. Jackson still played with Embryo live from time to time, but most importantly he now introduced Burchard to another black American jazz musician: Charlie Mariano. In December 1972 they recorded We Keep On (1974), which was a good album though it couldn't match any of their previous ones. The tracks were extracts from long jam sessions in the studio. The album found some recognition in the USA, partly due to the Mariano involvement and partly due to international distribution. Miekautsch quit the group in July 1973 to join Missus Beastley. Surfin' (1975) was a very mixed affair - one of their weakest albums ever. They were now heading into a lighter, funky jazz-rock direction, partially forced on them by their record company. The album was recorded in the Summer of 1974, partly with the new bassist Uwe Mullrich, previously a guitarist with Lokomotive Kreuzberg and an old friend of Roman Bunka. The ethnic styled sections were best, particularly the only extended track called "Dance Of Some Broken Glasses", a gentle and atmospheric track with Mariano on flute, Bunka on saz (a stringed instrument from Turkey) and Burchard on violin appearing one by one. Missus Beastley's music had also suffered from artistic compromises on their 1974 album. As a consequence, along with Embryo, Ton Steine Scherben, Sparifankal and Checkpoint Charlie they founded April, a company dedicated to independent music and offering artistic freedom. At the beginning of 1975, Dieter Miekautsch returned to Embryo. Later the band also got a female vocalist in Maria Archer. 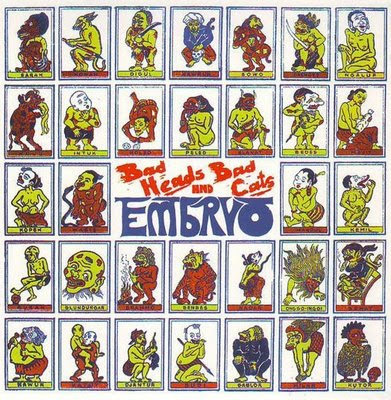 Embryo's first two April albums didn't seem to benefit much from this freedom, as Bad Heads And Bad Cats (1976) featured very standard and unimaginative funky jazz-rock. Live (1976), recorded during a tour of Austria, February 1976) was only marginally better. Hoffmann was now enlisted as a 'guest'! Embryo were also featured on the live festival samplers Umsonst & Draussen Vlotho Winterberg of 1975 with the track "Sidetrack", 1976 with "The Bad Times Are Gone". Some members were exchanged with Missus Beastley in the last half of 1976. Thanks alot again for the great music on your site !